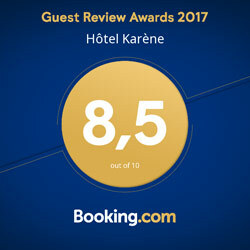 The hotel Karène offers you, in fine weather, to relax on one of its two shaded terraces. The outdoor pool awaits you to live a moment of relaxation and relaxation, quiet. The wide beaches bathed in sun will delight the followers of the deckchair. For our little guests, a playground is at their disposal with swing and trampoline. Find yourself in the heat of summer or the sweetness of Spring, with friends, with family during a game of balls in a green and relaxing. Please indicate a valide email for your booking.